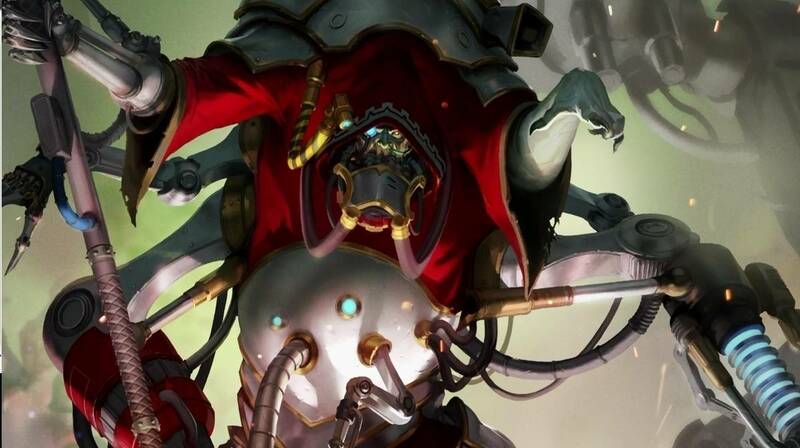 Today Loremasters, we celebrate the victories of the Adeptus Mechanicus by learning the lore of their defeated Necron foes. Amontep II is now firmly in the hands of the Adeptus Mechanicus–at least we can safely assume that as fact. After all, what hope could an army of machines stand against the Omnissiah and his Faithful, who are even now probably beginning the process of harvesting the valuable blackstone deposits so that they can continue to do the work of maintaining the Imperium and keeping it from falling to Chaos like the true scions of the Omnissiah they are. 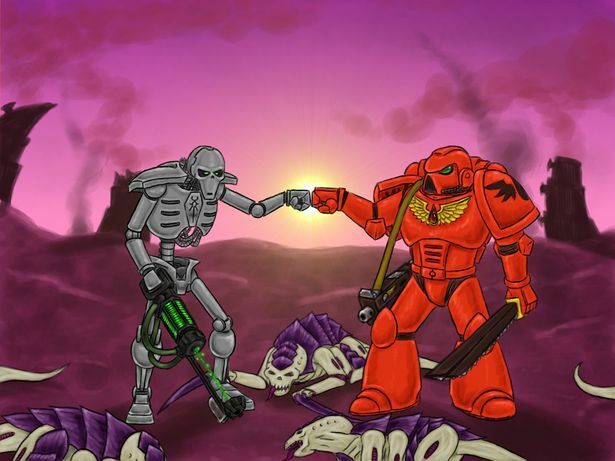 Don’t prattle to me about superior Xenos technology. There’s no device, no matter how heretical or technologically “advanced” it may appear to be that candefeat good old-fashioned Imperial know-how. Besides which, their technology (if it can be called that) must be ancient. And there’s no way ancient technology could be more advanced than what we possess now. So to celebrate our victors by defiling the memories of the defeated, let us examine how many of their so-called dynasties have fallen, all but forgotten by the mists of antiquity. The Arotepk Dynasty is a Necron Dynasty located to the south of Segmentum Tempestus. In 898.M41, they assaulted the Maiden World of Silentia to plunder an ancient gem that was most likely a shard of the Void Dragon. In 912.M41, this shard escaped from its imprisonment, laying waste to the dynasty in a mindless rage. Eventually Crypteks were able to force the beast back into its cage. There is a lesson to be learned from this Dynasty’s destruction. You ought never to mess with forces beyond your understanding–it is folly that invites ruin and disaster at every turn. Fortunately the Imperium would never dare commit such an affront to the Omnissiah. Then of course there are the fallen worlds of the Charnovokh Dynasty which have been ravaged by the hungering Tyranids. And we all know the Necrons would never be able to defeat Tyranids. Much of the territory it once ruled lies far to the galactic southeast, beyond the Eastern Fringe of Ultima Segmentum. As a result, many of its dormant Tomb Worlds were devoured by the Tyranid Hive Fleet Behemoth while countless others have been ravaged in counterattacks against the Tyranids by the Imperium. As a result, the remaining systems of the Charnovokh Dynasty are many, but small and scattered. Or consider the Dyvanakh Dynasty, which has only recently fully awoken. Disoriented by their long slumber, the Dyvanakh Dynasty were left vulnerable to an assault by a nearby Forge World of the Imperium. 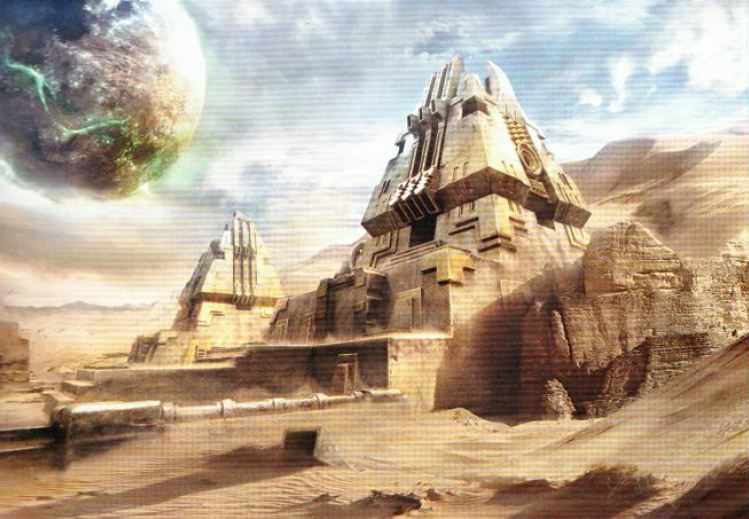 Eventually, the Dyvanakh were able to repel the human siege and drive the Imperial forces from their world. Since then, they have been attempting to search for other lost Tomb Worlds of their Dynasty. Thus far they have been unable to make contact with any, as the missing Dyvanakh worlds were engulfed and destroyed by a Warp Storm thousands of years ago. If an Imperium world were to be engulfed by a Warp Storm, you can rest reassured that they would survive no matter the cost. There is no record of a single Imperial world that has ever fallen to the vagaries of the warp. And of course there’s the tale of technology turned against its masters, which we all know would never happen to the brilliant minds of the Adeptus Mechanicus, but which did happen to the Empire of the Severed. Based out of the Tomb World of Sarkon, the Empire of the Severed is a world that was wracked with radiation storms while the Necron slumbered within. The radiation ravaged the memory banks of every Necron interred within, wiping their minds and rendering them mindless. Not realizing its own systems had also been damaged, the master program of Sarkon observed the quiet order it had brought to Sarkon and resolved to carry it to other worlds. The Master Program has since become a Necron Overlord known as the Sarkoni Emperor. The Severed have since absorbed the Tomb World of Takarak, overwhelming its defenses and absorbing it, along with three other Tomb Worlds, into its fold. 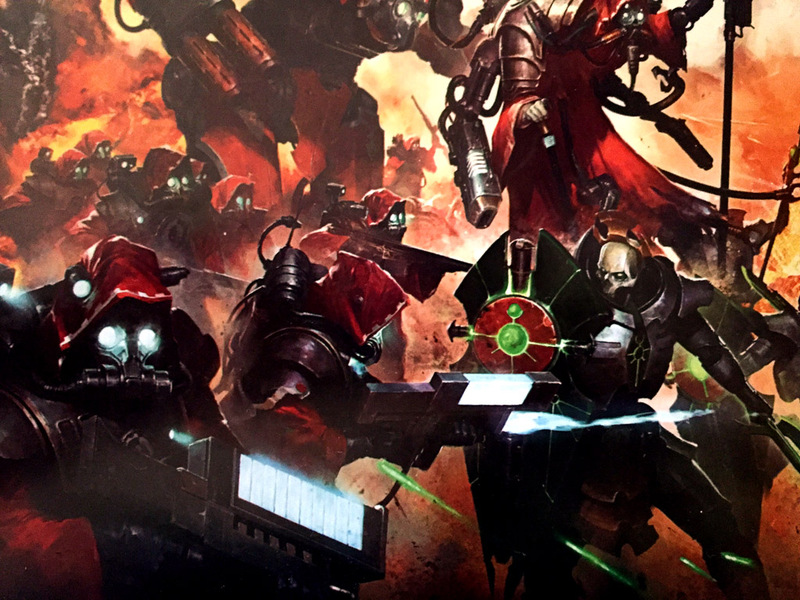 The Sarkoni Emperor has since begun to extend its will across other, non-Necron worlds, using Mindshackle Scarabs to bring any unruly creatures under its direct control. And finally, there is the Khansu Dynasty. Initially opposed to the biotransference that transformed the Necrontyr into the Necrons, they were thrown into open rebellion against the transformation of their species into vessels of living metal, which might seem like folly–but remember that this was not the Omnissiah’s grace they were stepping into. When it became apparent that the Triarch was determined to go through with the process, the Khansu openly revolted. Ascendent Prince Rakszan was one of the few amongst the Khansu that chose biotransference and was rewarded by his C’tan masters with the rank of Phaeron. 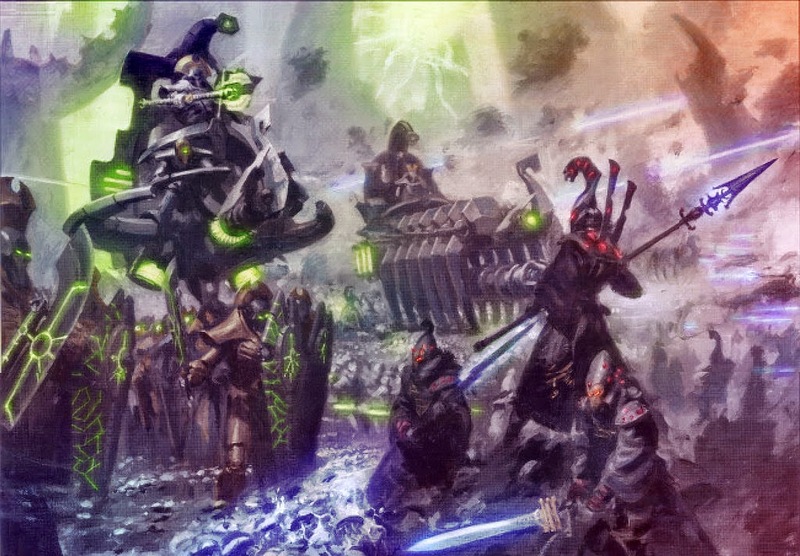 Rakszan commanded the legions of Necrons that brought the Khansu to its heels, and the last of the Khansu were dragged to the biotransference chambers by force. As the War in Heaven ground on, the warriors of the Khansu were increasingly used as expendable troops or cannon fodder. During the revolt against the C’tans by Szarekh, Rakszan joined his Necron brothers against the C’tan out of anger for this indignation. Eventually, the nobles of the Khansu Dynasty were destroyed in the War in Heaven and C’tan revolt, its Warriors and Immortals seized by other dynasties and reprogrammed to their service. The sole surviving member of the Khansu Dynasty is Rakszan himself, on an eternal quest of vengeance to find and imprison every C’tan Shard. Now the Necrons are being pushed back at every turn by the superior technology of the Adeptus Mechanicus. The lesson here is those that live in history are doomed to repeat it, but if progress marches on, heedless of the past, unbounded by flesh–then the Imperium can be kept safe for one and all.